Colby James (#10) catches Daddys Sugar Mama (#9) to set the fastest qualifying time Saturday from 11 trials to the $393,180 New Mexican Spring Futurity(RG2) at Sunland Park. SUNLAND PARK, NM—APRIL 13, 2019— Colby James was the top qualifier for the $393,180 New Mexican Spring Futurity(RG2) following 11 trials on Saturday at Sunland Park Racetrack and Casino. 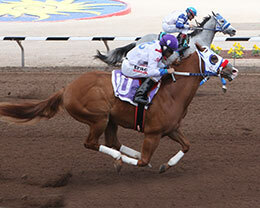 The two-year-old New Mexico-bred son of Jesses James Jr won the first heat in a fast :15.136 seconds. The debut winner was ridden by Alan Hernandez for trainer Rodolfo Valles. Colby James earned a 95 speed index. Out of the Blushing Bug mare Sandy June Bug, Colby James was the first of seven qualifiers bred by MJ Farms. Stallion's standing at the Veguita, New Mexico farm sired nine of the 10 New Mexican Spring Futurity qualifiers. Daddys Sugar Momma, runner-up in the opening trial, was the first of six finalist sired by leading New Mexico sire Big Daddy Cartel. She held on for the second fastest time of :15.162 seconds. Jose Luis Muela conditions the gray filly for owner Diamond Racing Stables. Carrol Durbin bred Daddys Sugar Mamma from the Gonna Ro Sham Bo mare Ms Payment Deferred. CLICK HERE for a complete list of the New Mexican Spring Futurity(RG2) finalists, times, sires, dams, owners, breeders, trainers and jockeys. The second 10 fastest qualifiers from today's New Mexican Spring Futurity(RG2) trials are preferred invites for the $50,000 New Mexican Spring Fling Invitational. For a list of those horses CLICK HERE. Live racing resumes on Sunday at 12:50pm (MDT).